Figure 1. Extensor tendons, located on the back of the hand and fingers, allow you to straighten your fingers and thumb. Extensor tendons are just under the skin, directly on the bone, on the back of the hands and fingers. Because of their location, even minor cuts can easily cause extensor tendon injuries. Jamming a finger may cause these thin tendons to rip apart from their attachment to the bone. With extensor tendon injuries, you may have a hard time straightening one or more joints. Treatment is necessary to return use to the tendon and finger. Mallet finger refers to the droop of the end joint where an extensor tendon has been cut or separated from the bone (see Figure 2). Figure 2. The mallet finger deformity causes a droop of the fingertip due to extensor tendon injury at the last finger joint. Sometimes a piece of bone is pulled off with the tendon, but the result is the same: a fingertip that cannot actively straighten. Whether the extensor tendon injury is caused by a cut or jammed finger, splinting is necessary. Often the cut tendon requires stitches. A splint is used to keep the fingertip straight until the tendon is healed. The size of the splint and length of time you will have to wear it is determined by the type and location of your extensor tendon injury. The splint should remain in place constantly during this time. 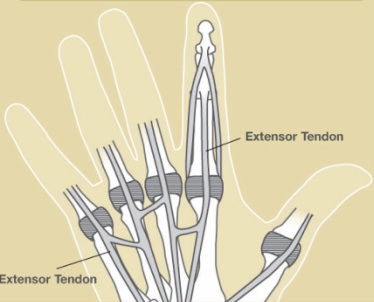 The extensor tendon may take four to eight weeks, or longer in some patients, to heal completely. Removing the splint early may result in drooping of the fingertip, which may then require additional splinting. Your physician will instruct you to remove the splint at the proper time. Sometimes there is a mild permanent droop, despite proper splint wear. Boutonnière deformity describes the bent-down (flexed) position of the middle joint of the finger from a cut or tear of the extensor tendon at the middle joint (see Figure 3). Treatment involves splinting the middle joint in a straight position until the injured tendon is fully healed. Sometimes, stitches are necessary when the tendon has been cut and even if the tendon is torn. If the extensor tendon injury is not treated, or if the splint is not worn properly, the finger can quickly become even more bent and finally stiffen in this position. Be sure to follow your doctor’s instructions and wear your splint for a minimum of four to eight weeks. Your doctor will tell you when you may stop wearing the splint. Lacerations or cuts on the back of the hand that go through the extensor tendons cause difficulty in straightening the finger at the large joint where the fingers join the hand. Stitching the tendon ends together is the usual way of treating these injuries, followed by splinting to protect the repair. The splint for extensor tendon injury in this area may include the wrist and part of the finger. Dynamic splinting, which is a splint with slings that allows some finger motion, may be used for injuries of this kind. The dynamic splint allows early movement and protects the healing tendon. Figure 3. The boutonnière deformity with progressive flexion, or bending, of the middle joint may result in a stiff finger in this position if not treated. The end joint also hyperextends (bends backward) from the altered force across the finger.